Rink Rover: Who's your CWHL team? Orestes: Women who serve this house, they come like gorgons, they wear robes of black, and they are wreathed in a tangle of snakes . . . . These are no fancies of affliction. They are clear, and real, and here; the bloodhounds of my mother's hate . . . . Ah, lord Apollo, how they grow and multiply, repulsive for the blood drops of their dripping eyes. I love the Toronto Furies not on account of where they play, their partnership with the Leafs, nor even their decision to wear the Leafs' colours. 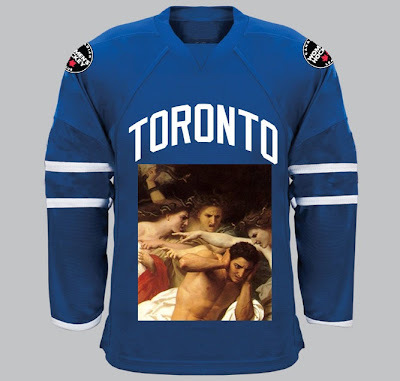 Rather, I'm a Furies fanatic because they are one of the few North American sports teams that appeals to my geeky interest in classical literature. Indeed, they chose a name that both better reflects my research interests and better expresses a team's desire to win through badassery than the Toronto Argonauts. The Furies or Erinyes, cthonic deities of vengeance from Greek and Roman mythology, had snaky hair, blood-drops streaming from their eyes, and (sometimes) wings. They pursued wrongdoers relentlessly. While driving their targets insane and making them ill, the Furies would also afflict entire communities who harboured transgressors by making them suffer disease and dearth. Some traditions claim that they sprang to life from the blood of Uranus after he was castrated by his son, Saturn. Is there a better way for a women's hockey team to assert their determination to carve out a niche for themselves in a male-dominated sport than to name the franchise after creatures that evoke emasculation? The closest thing would be the Amazons who supposedly cut off their right breasts they got in the way of their throwing or arrow-drawing arms. Here's a picture of two Furies during some down time. "Don't you hate it when your hair bites your wings?" "Well, as a vengeance goddess such as yourself, I hate pretty much everything." These lounging figures might not looking threatening, but they're probably just letting their last victim digest before seeking out the next one. 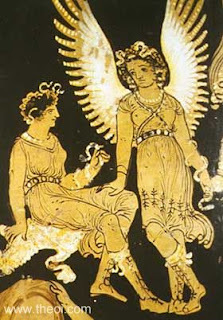 Unlike other figures in classical mythology who became unemployed and forgotten following the spread of Christianity, the Furies were kept on the underworld payroll and assigned to administering infernal affairs in the lowest circle of hell in Dante's Inferno. So Toronto's CWHL team has chosen a nickname that corresponds with unfailing, unfaltering, and nearly indefatigable female vengeance. All they need now is a new jersey that better captures their ferocious self-image. Might I suggest the following?